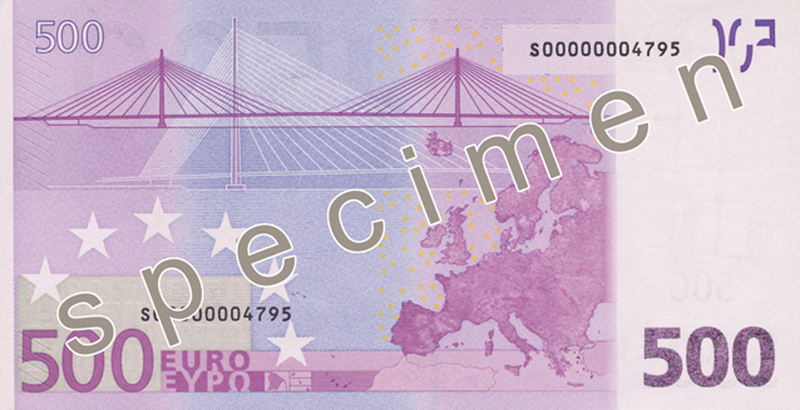 Additional tactile marks for the visually impaired are included on the bottom edge of the 200 Euro banknote and on the right-hand edge of the 500 Euro. 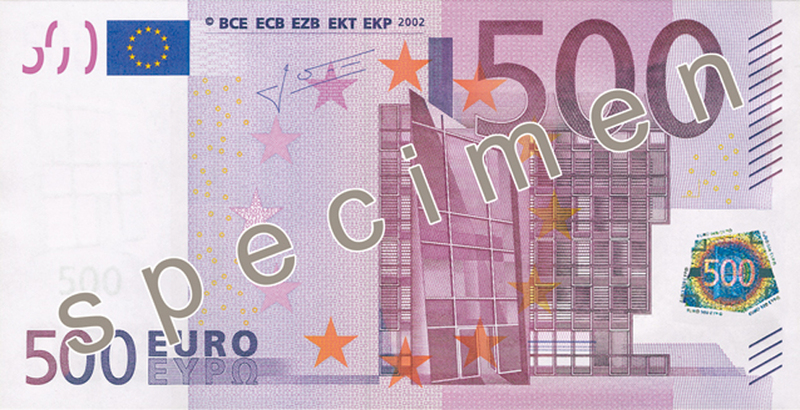 Marks printed in the top corner of the 500 Euro note, on both sides, combine perfectly to form the value numeral. You can see the complete number when holding the banknote against the light. The security thread is embedded in the banknote paper. Hold the 500 Euro note against the light - the thread will appear as a dark stripe. The word "EURO" and the value can be seen in tiny letters on the stripe. Hold the note against the light. Euro symbol. You can also see small numbers showing the value. 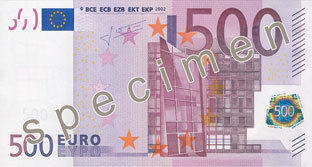 Tilt the 500 Euro note – the hologram image will change between the value and a window or doorway. In the background, you can see rainbow-coloured concentric circles of tiny letters moving from the centre to the edges of the patch. On some areas of the 500 Euro note you can see tiny writing, e.g. inside the "EYP?" (EURO in Greek characters) on the front. You will need a magnifying glass to see it. The microprinting is sharp (not blurred).